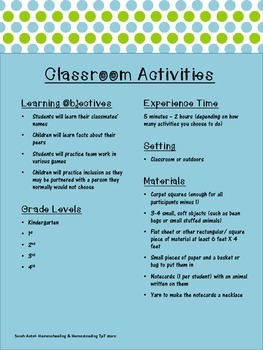 The activities included in this product make wonderful Morning Meeting activities. Many are appropriate for the beginning of the school year, other activities can be played year-round with your group. All games have detailed instructions on how to proceed with the activity. 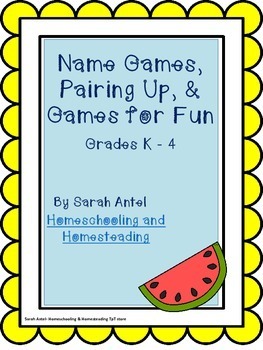 All games have been used by Homeschooling and Homesteading in classrooms and outdoor groups. These activities are grouped into three pieces. The first segment has detailed instructions for several name games. The next group of activities are fun ways to get your students in pairs. The final group of games are fun activities when there is down time. Once the children learn the games, they will be able to facilitate the games independently. 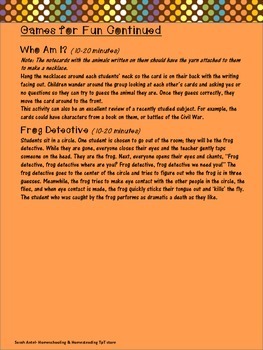 Complete collection of our group dynamics games. Follow our store to stay up-to-date on new products!